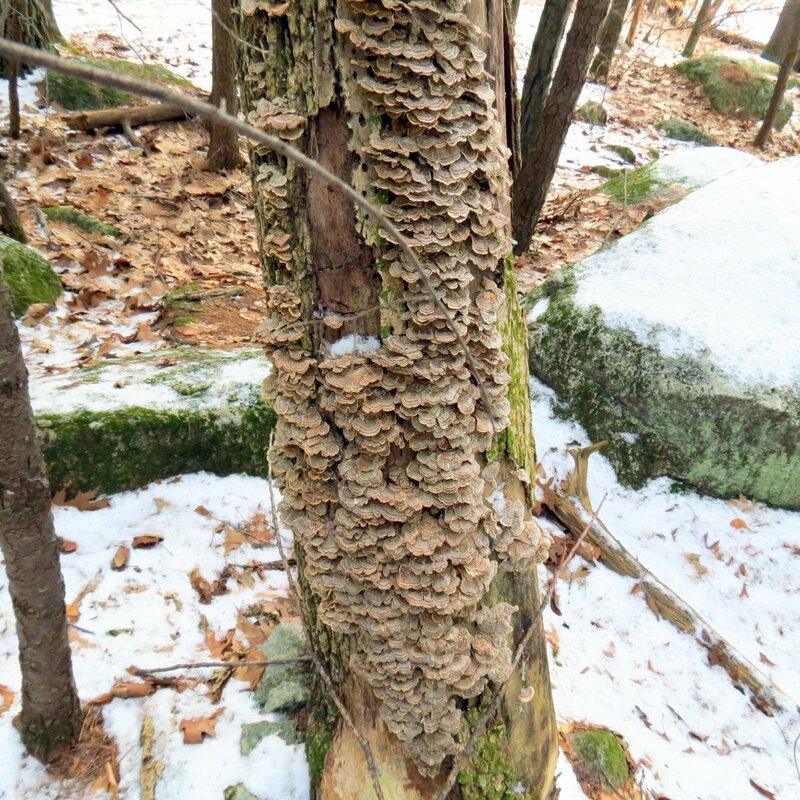 Robin Hood Park is a 110-acre park located in the northeastern corner of Keene that I visit often at all times of year, but especially in summer to see all of the amazing fungi and slime molds that grow there. In 1889 George A. Wheelock sold a piece of land known as the Children’s Wood to the City of Keene for a total of one dollar. This area was eventually combined with an additional parcel of land purchased from Wheelock, known as Robin Hood Forest, to form Robin Hood Park. This park has been enjoyed by children of all ages ever since. I decided to go there last Saturday because I couldn’t remember the last time I had been there. The small pond in the park has drawn ice skaters for a very long time, but this year the unusual warmth has kept people off the ice. This is where I learned how to ice skate 50+ years ago. 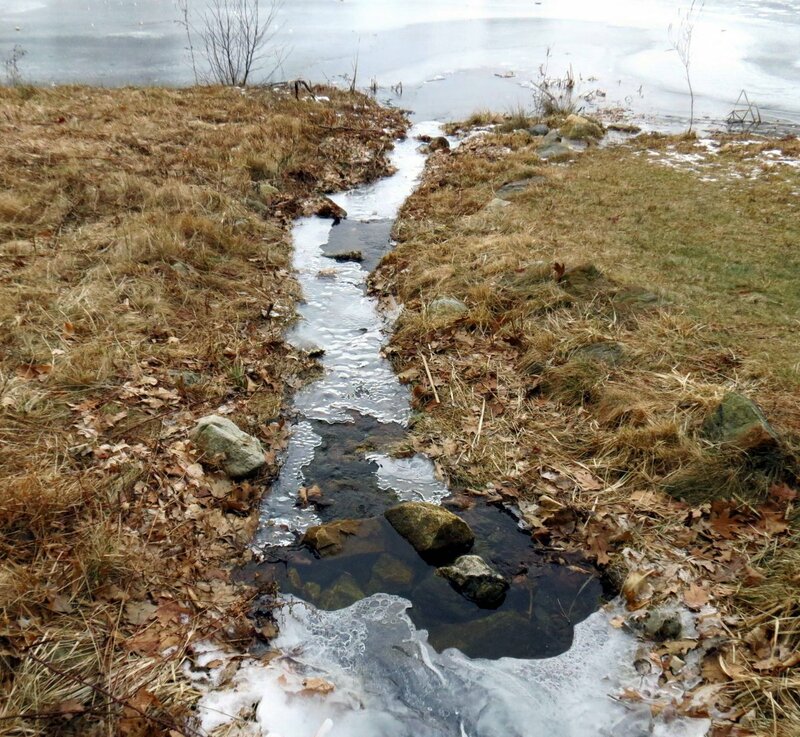 There are various small streams and rivulets that feed into the pond. Even though it was only 22 degrees F. on this day none of them had frozen over but they were trying, as this one shows. There were lots of bubbles in what ice there was. 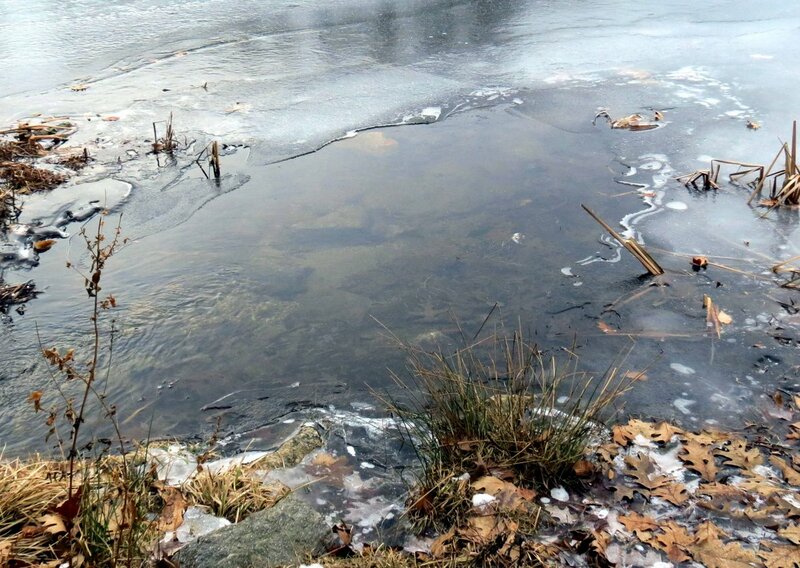 The spot where the little stream enters the pond showed just how thin the ice was. 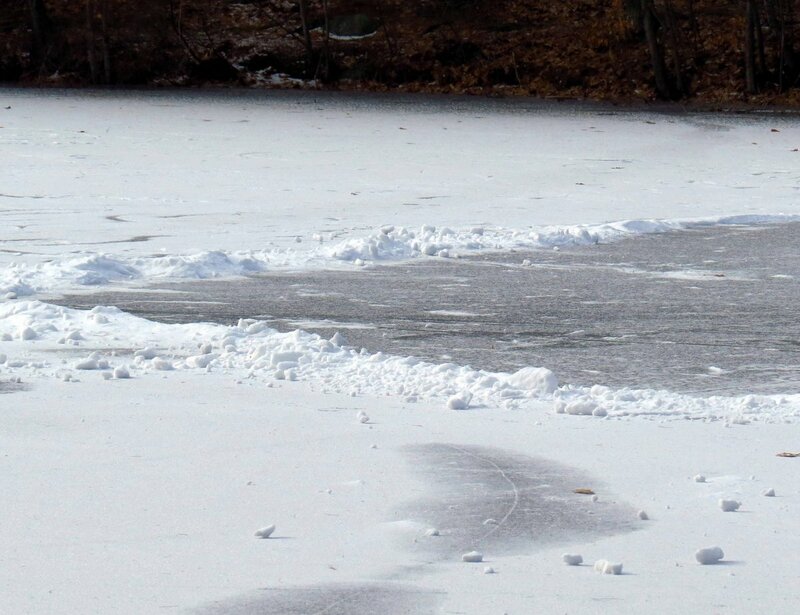 But still, even with all the warnings both natural and man-made, someone had shoveled off a large rectangle to skate in. We humans can be very stupid at times. Note how wet the snow is where the water is coming up through the crack in the ice. 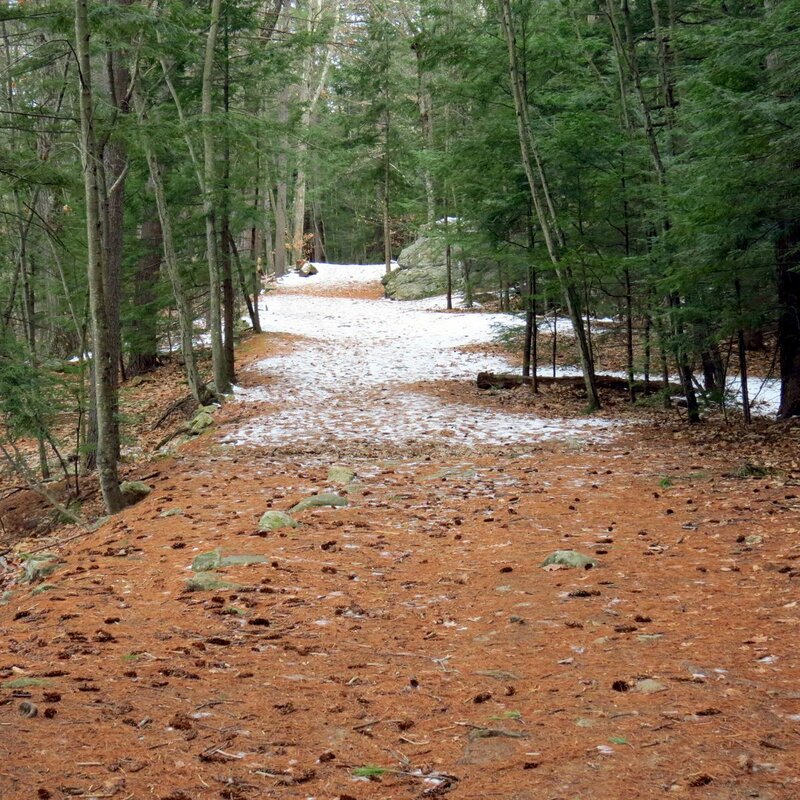 I got away from the pond and followed the trail that leads around it. There are many interesting things along this trail and I see things I’ve never seen almost every time I come. 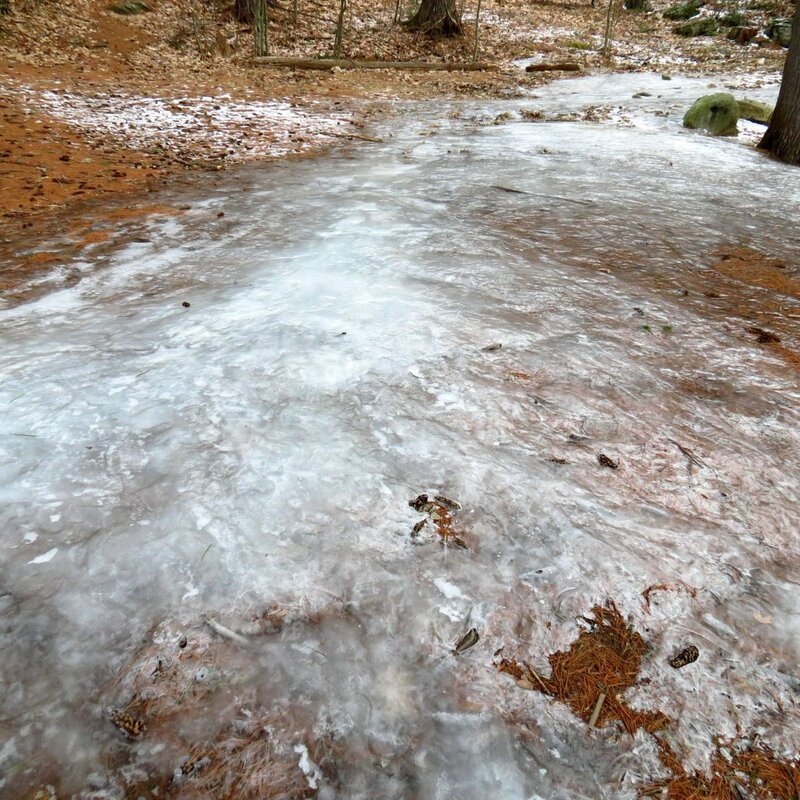 Unfortunately there was nothing new about the thick ice on parts of the trail. There is a lot of groundwater here and ice like this is common in winter so I wore my new micro spikes. With them on I walked right over this ice and didn’t slip or slide one bit. It’s amazing how they grip; you feel like you couldn’t slip if you wanted to. 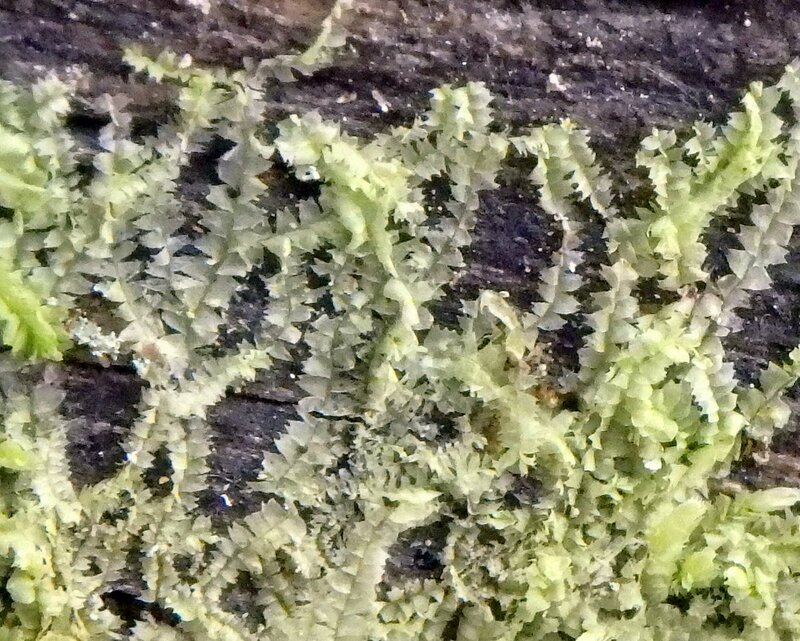 One of the things I saw on this day that I’ve never seen before is a liverwort called the Bifid crestwort (Lophocolea bidentata.) It grew on a log and at first I thought it was a moss. 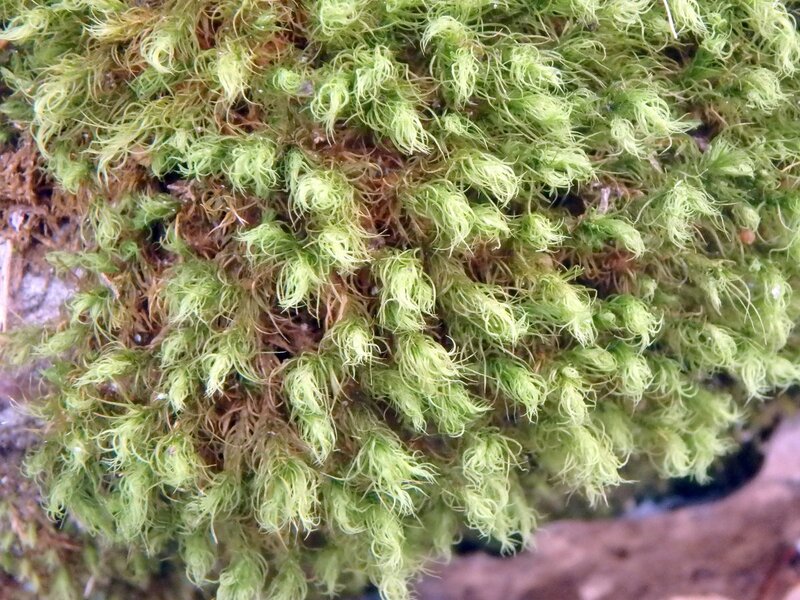 But I’ve never seen a moss that looked like this and I suspected right off that it must be some type of liverwort. 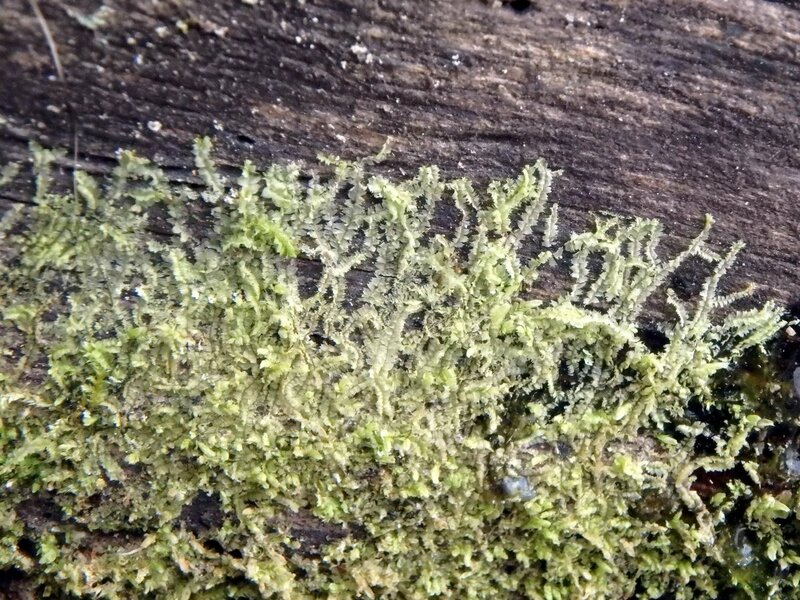 It is a leafy liverwort and each leaf is flattened with two notches at its tip (Bilobed.) Each lobe is drawn out to a long, narrow point. As you move up the stem the leading edge of each leaf is tucked behind the trailing edge of the leaf ahead of it. Both of these features help with identification as does the pale yellow green color. What I didn’t know at the time I saw it is that the plant is very aromatic, so the next time I see it I’ll have to smell it. There was no question that this was a moss. Broom moss (Dicranum scoparium) gets its name from the way its curly tipped leaves look like they have all been swept to one side. In fact the scoparium part of the scientific name is Latin for broom. It prefers dry shaded places and won’t tolerate wet feet. Florists call it mood moss but I’m not sure why. 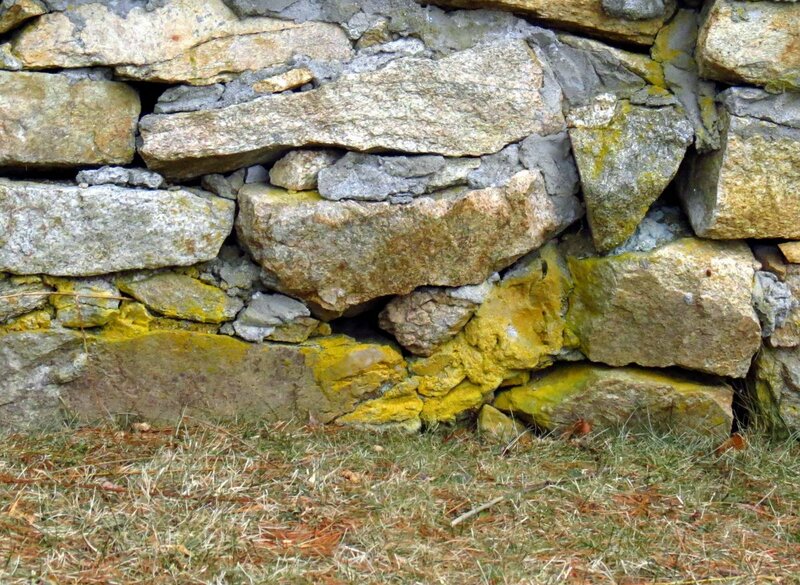 Mosses can change color in the cold and so can lichens. 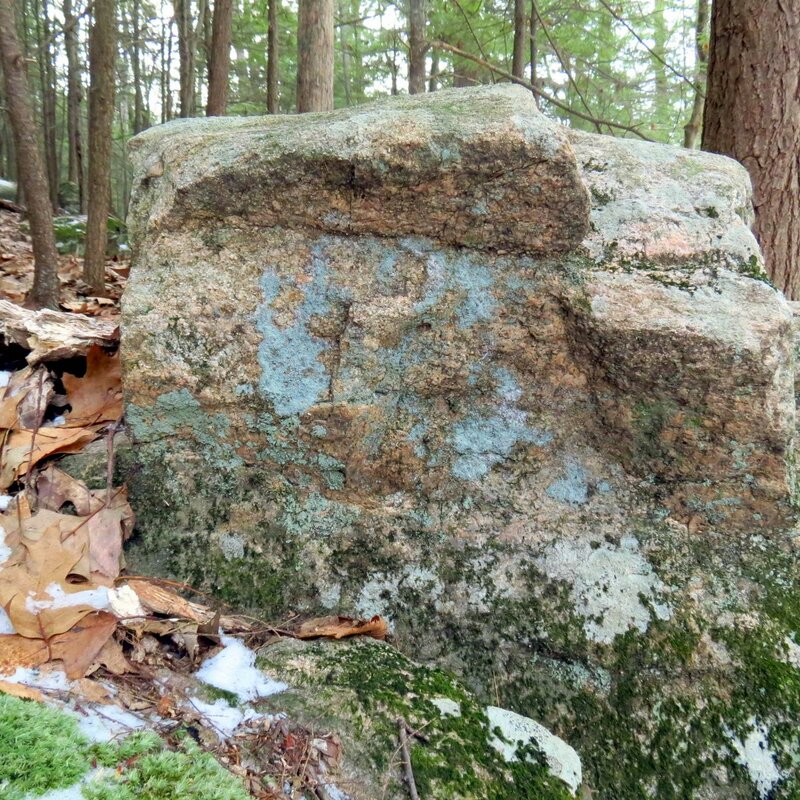 In the summer the blue gray lichens on this stone will become ashen gray and all but disappear into the color of the stone. It’s something I’ve noticed happening for years but I’ve never been able to identify the chameleon like lichen. This buttressed tree root reminded me of a beautiful yellow slime mold I saw here one day a few years ago. Buttressed tree roots usually grow on all sides of the tree but this huge old oak has just the one. Roots that grow like this are said to grow because of nutrient poor, shallow soil but if that were true then it seems like all of the trees in this forest would have them. They are usually found in rain forests on very tall trees. 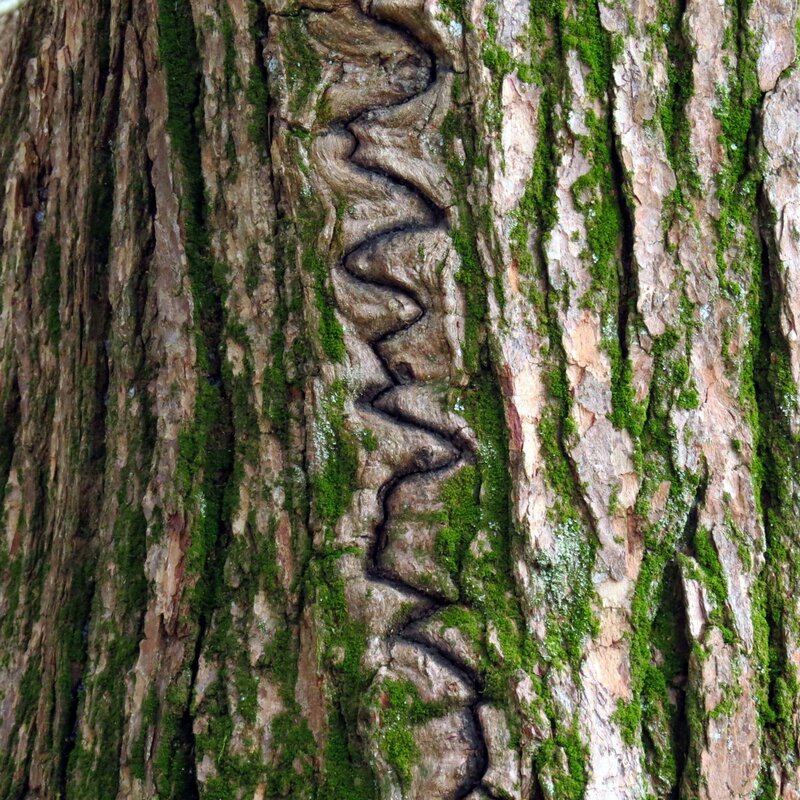 Something I’ve never been able to explain is the zig zag scar on this tree. I’ve shown it here before and blog readers have kicked around several ideas including lightning, but none seem to really fit. The scar is deep and starts about 5 feet up the trunk from the soil line. If it were a lightning scar I would think that it would travel from the top of the tree into the soil. I happened upon a large white pine tree once that had been hit by lightning very recently and it had a perfectly straight scar from its top, down a root, and into the soil. The bark had been blown off all the way along it. I’ve seen some strange things in the woods and this is one of them. 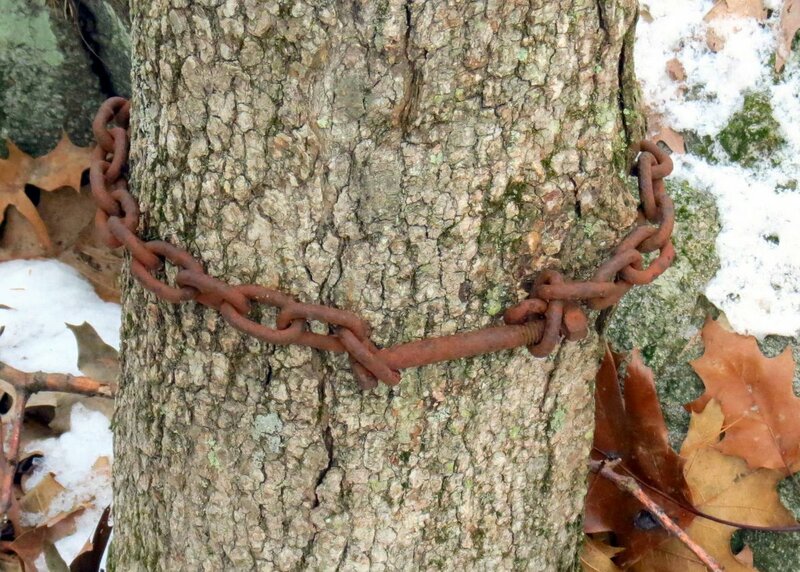 Someone put a chain around this tree for no apparent reason. What will happen is the tree will grow around it and over time simply absorb it. It will become a tree cutters nightmare; one of those thing you hope you never run into with a chainsaw. 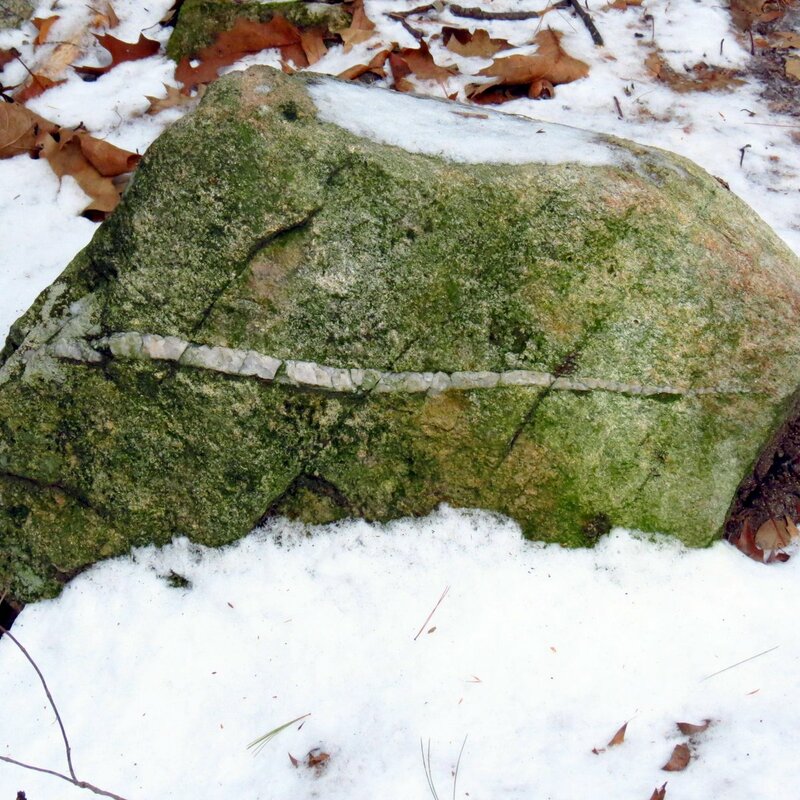 This granite stone has a spear of either quartz or feldspar in it. I think, if I remember my geology correctly, that it would be called an intrusion or vein. Granite itself is considered an intrusive igneous rock. 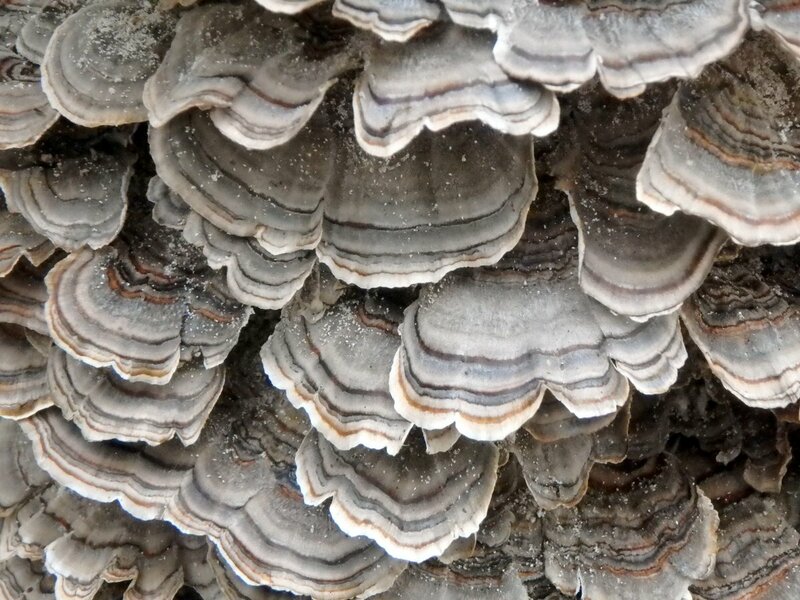 Turkey tail fungi (Trametes versicolor) are common enough but you don’t often find them growing on a standing tree as these were. There were many hundreds of them all around the tree. Some of the turkey tails were quite colorful with lots of orange and lavender bands. 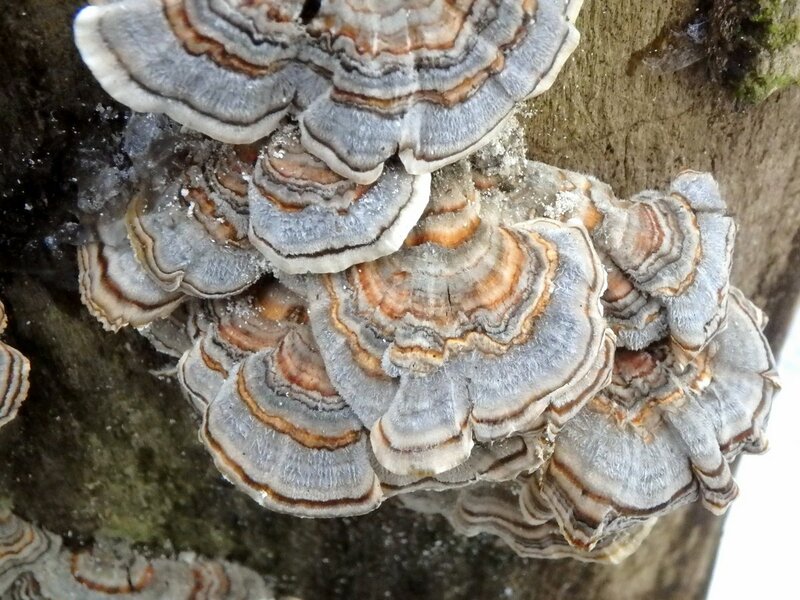 Other turkey tails on the same tree were much less colorful and this is interesting. For years I’ve tried to find out what determines the color of these fungi and I assumed it must be the wood itself, but these examples with widely varying colors were all growing on the same wood, so that can’t be it. These are in fact wood eaters which decompose wood so it can be returned to the forest soil to be used again by a new generation of trees. Life is a circle and not a single molecule is lost or wasted. Yes. Sometimes the “sapiens” in homo sapiens seems a bit of a misnomer when we look around. Meantimes I am grateful for all the beauty you (and Nature) are sharing here. Thank you. You’re welcome Ben, and thank you. I never did learn how to ice skate. There were skating rinks in the suburban sprawl where I grew up but no skating ponds. I spent as much time on my backside as I did on the skates so you didn’t miss much. That’s an interesting moss. Sure is pretty! In a post filled with interesting finds, the liverwort and moss struck my fancy the most, although the ice images and turkey tails rank toward the top as well, Oops, for got the scar and the chain around the tree for no reason. 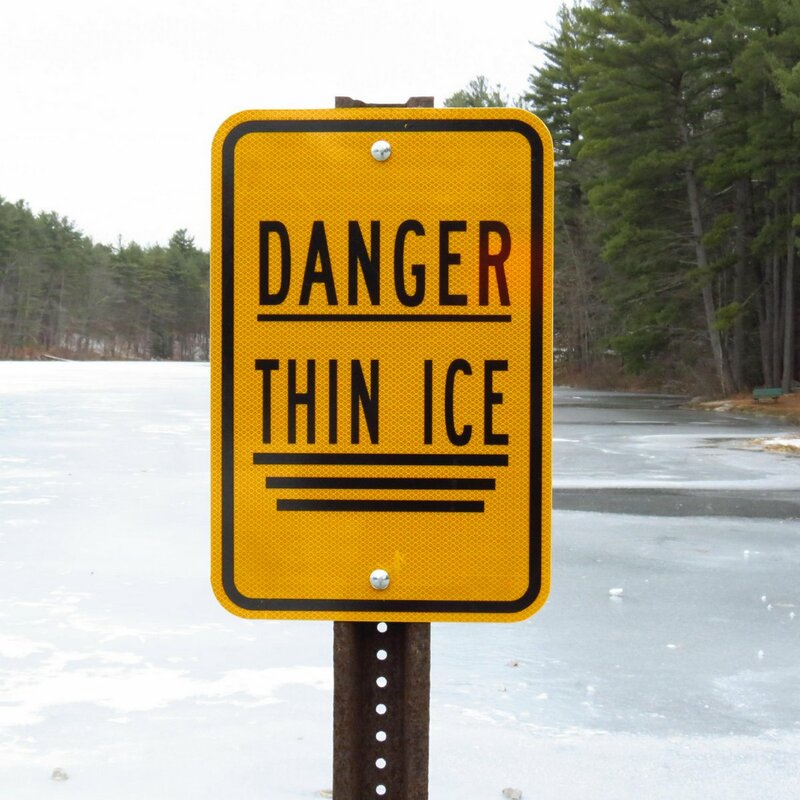 I used to press my luck when I was a kid as far as walking out onto ice that would bow under my weight, until I broke though and realized how cold the water really was, I can believe that people would skate on such thin ice. Thanks Jerry! My grandmother’s brother died from falling through the ice and I came close to falling through river ice, so I get real nervous when I see people doing what these people were. Another wonderful winter walk. 🙂 I see so many lichens, mosses, and fungi out here on hikes in the PNW and have no idea what they’re actually called. I have a feeling you’d be an amazing guide on such a hike. Thanks very much. I usually go into the woods alone but I recently went on a few hikes with my daughter and son in law and found myself explaining all kinds of things without even realizing I was doing it, so you might be right! An interesting walk, as always! 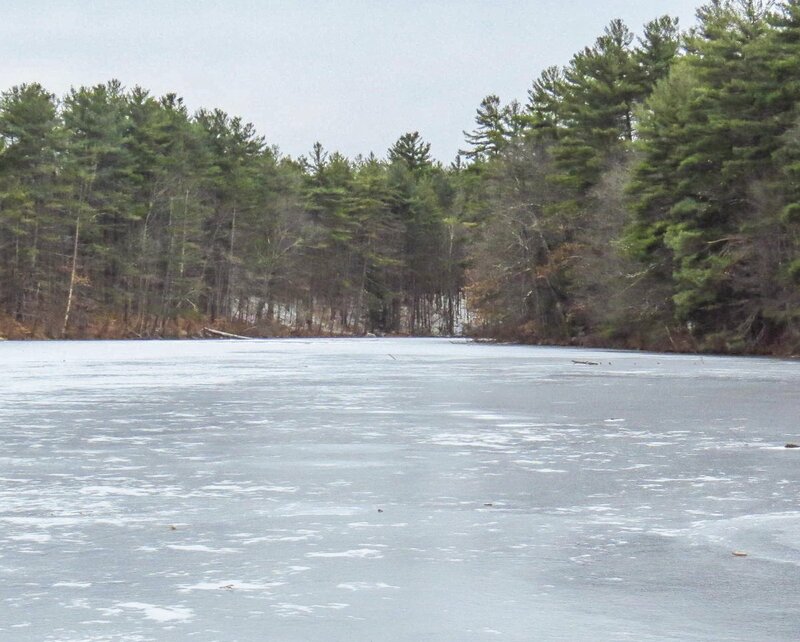 I remember learning to skate long ago on a local pond belonging to a friend’s family. The turkey tail mushrooms are very beautiful. 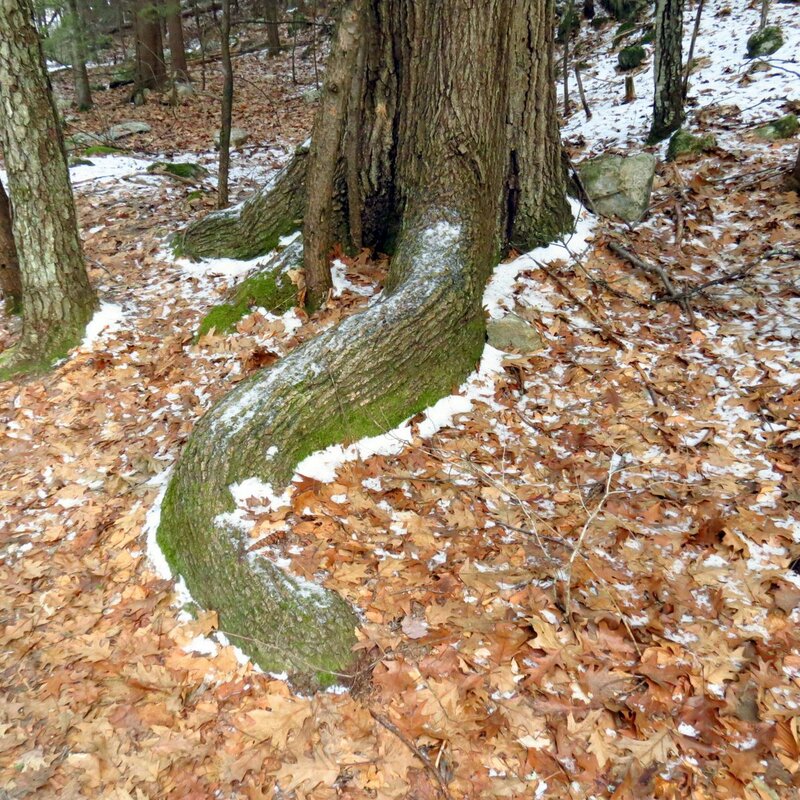 I wonder if that zigzag tree scar is freeze cracking? Thank you Lavinia. I learned to skate on that pond, if I remember correctly. I’ve seen lots of frost cracks on trees and they,ve always been dead straight, but this one could be different. I doubt we’ll ever really know what made it. The turkey tails were very impressive as was the stupidity of the would be skater. The turkey tails I might come to understand one day. The humans, I doubt it. What a fascinating post, full of intriguing tidbits! The tree with the mysterious scar, the lichen that disappears in summer, and so on and so on. Robin Hood Park is a great name for a children’s park. It’s nice to know that’s where you skated as a boy. Thank you Cynthia. I think I spent more time falling than I did skating but that’s what I called fun then. The man who came up with the name Robin Hood Park certainly loved children, and the park is what he left them. Many thousands have enjoyed it ever since. Keep us posted about that mark. I was struck by your remark “Life is a circle.” So true. Now, we humans need to take this lesson to heart. We are such a wasteful species. Thank you Laurie. I expect that someday I’ll find out what made such a strange mark. It might have just been a boy with a new pocket knife. I agree, we are very wasteful and I hope there is a way to change that! 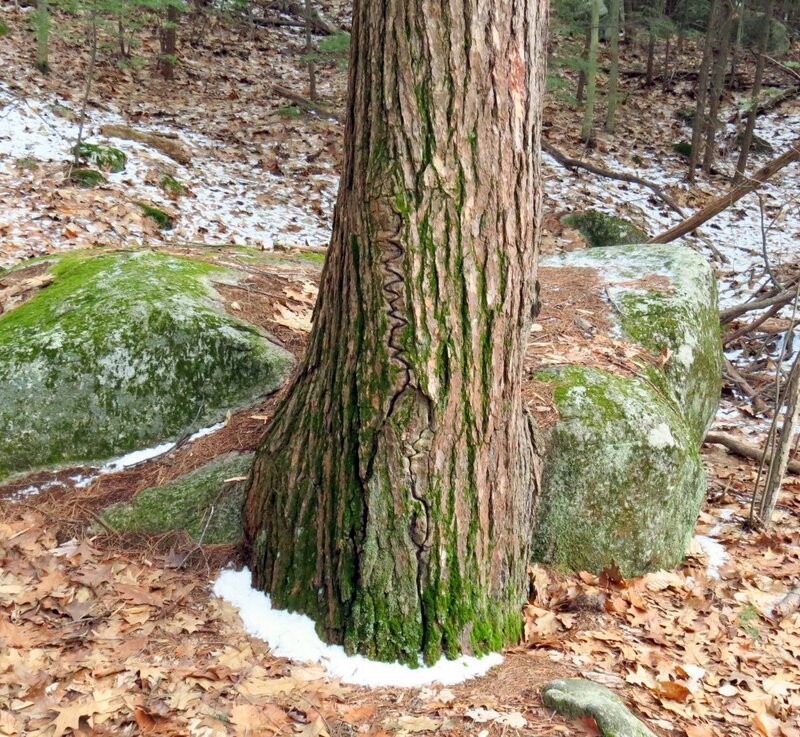 My guess for the mark on the tree is an old insect trail – made when the tree was young and now (hopefully) healed over. Have you asked Charley Eiseman (co-author of Tracks & Sign of Insects and other Invertebrates)? He has a very interesting blog. And is probably a good resource. I think he is very approachable for questions. And probably loves interacting with others who spend so much time in the wood! More eyes! Thank you Cindy. You could be right. Nobody has guessed that yet! I have been to Charley’s blog and he seemed so busy I didn’t want to bother him. He probably would be interested in that scar. 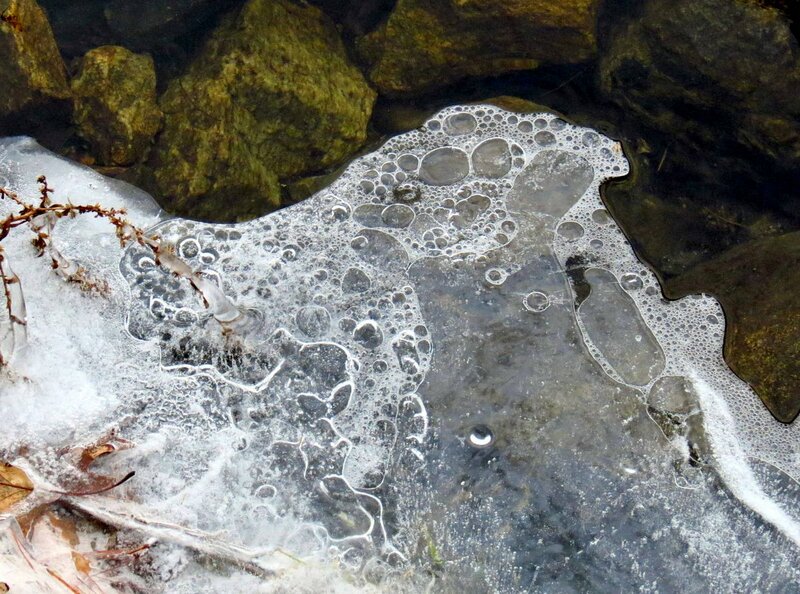 Loved the ice pictures especially the one with bubbles in it, something I have never seen myself. Thank you Susan. You might be lucky that you never have seen them. It’s been cold!